I did this illustration awhile back. 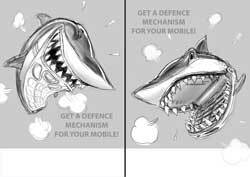 The idea of the campaign (that it was for) was to visually incorporate different animals’ defense mechanisms on cell phones. 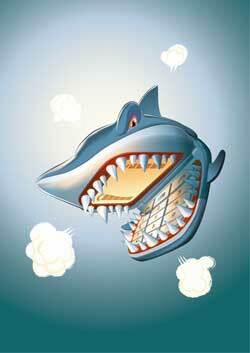 My animal was a shark. With the brief I got an image that illustrated the concept and which to me seemed like a stock image that someone else had done. So i was a little hesitant as to how to approach the assignment since I didn’t want to rip off or copy someone else’s work. Well, with a little research it turned out that the image was actually a montage of two different images and it had probably been done at the ad agency that hired me, so I was free to do whatever I wanted with it. So, off to sketching I was. 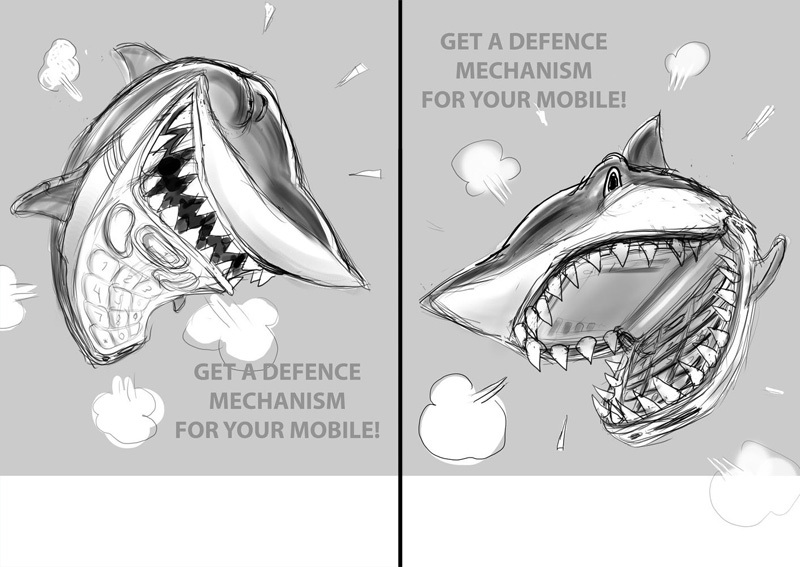 First I googled a bunch of reference images of cell phones and sharks and drew a few quick sketches to get a grasp of how they looked and how I could mix them up. Since the image would be a single character on a basically blank background, the shape and design of the cell phone shark would have to be interesting enough to hold the image and composition together. So I started thinking in shapes. The first one was pretty much a cleaned up and refined version of the thumbnail. The second was a combination of two different sketches. I wanted both of the sketches to have a sort of a fake fish eye perspective. I added the mockup type, and sent the sketches to the client. Some extra space added around the edges for cropping and bleed.